By now, the world knows that Jeffrey Sebelia took home the top prize on Season 3 of Project Runway. Jeffrey’s current label, Cosa Nostra, designs rocker–chic gear for various celebrities. His final collection for Project Runway, amidst the controversy, was eclectic, cutting–edge, and skillfully styled. 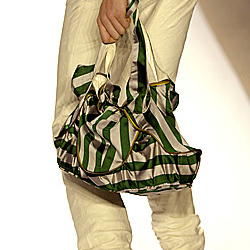 Unlike the other three designers, Jeffrey included a handbag in his collection, to complement the green and cream striped satin fabric incorporated in several of his looks. His satchel, composed of the satin fabric, was given a rocker edge with a yellow zipper piped around the body of the bag. Former Project Runway winners have created bags as well. 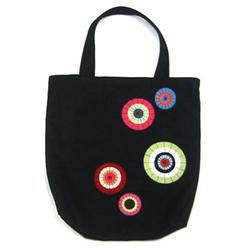 Season 1 winner Jay McCarroll developed an eponymous tote bag, black canvas decorated with multicolored circular shapes. Season 2 winner Chloe Dao made her foray into handbag design by incorporating a Tim Gunn-ism onto her barrel bag. 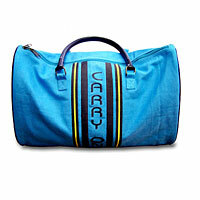 A blue canvas body is accented with black faux leather trim and a “Carry On” stitched onto the front of the bag. And if you’re like Vincent and fashion turns you on, ‘get auf’ with the “Auf Wiedershen” Flight Bag is for you. 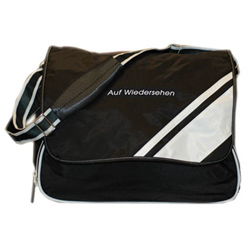 A black and white nylon messenger bag has a main compartment, a hidden partition for shoes, and a friendly ‘auf wiedershen’ displayed on the front flap. Project Runway designers have mastered the art of brilliant design. Let’s see if they can translate their skills over to handheld design as well.